We don’t know how Amazon will avoid dropping packages on your head. Or how the neighbor kid with great aim will be able to resist plucking one out of the sky. 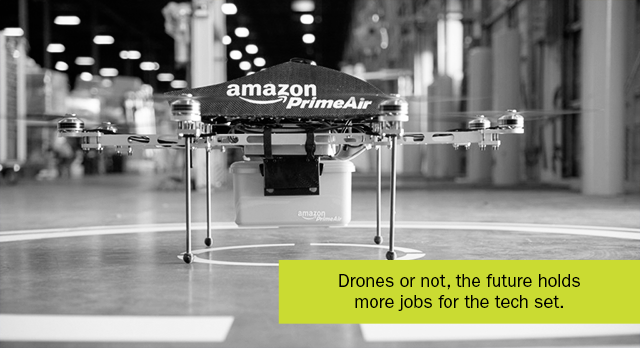 But we do know that packages delivered by drones won’t arrive without a host of technical talent. In case you missed it, Amazon CEO, Jeff Bezos, recently revealed that Amazon plans on delivering packages by drones in the future. Sounds like sci-fi, but is it really that far-fetched? While Amazon is still quite a ways from actually launching drones into the air, there’s no doubt that organizations are racing to be more efficient, automated, and cost-effective. Robotics, engineering, network architecture, project management – drones or not, the future holds more jobs for the tech set, and less work for manual skilled labor. Companies need innovation to compete now more than ever, and will require continued procurement of technical talent. At the same time, the ability to stay gainfully employed will rely on acquiring and maintaining an evolving set of technical skills. And if you aren’t technically inclined? Better sharpen those customer service skills – we’re gonna need to chat with someone when a drone delivers the wrong brand of toothpaste to our doorstep.